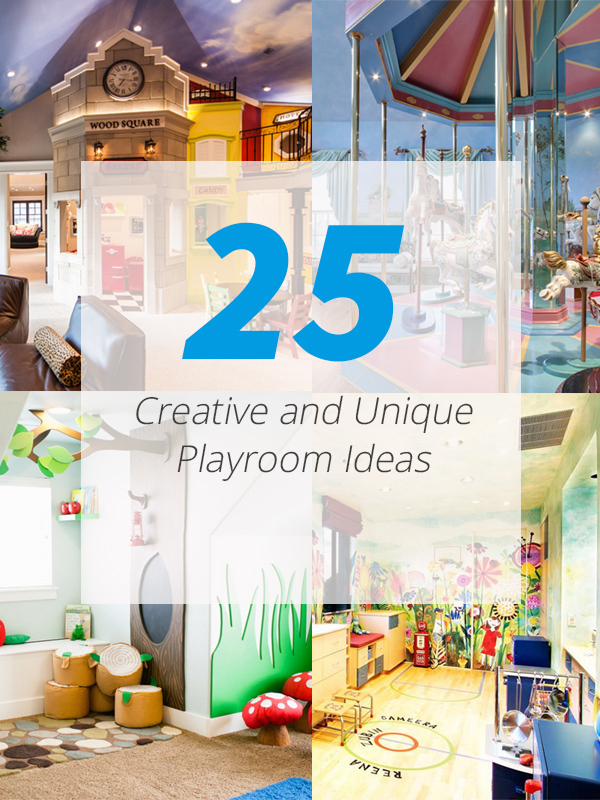 Your kids will love to own a playroom like the ones on this list. It is every child’s dream to have their own playroom. This way, they will be able to expand their ideas and enjoy playtime. 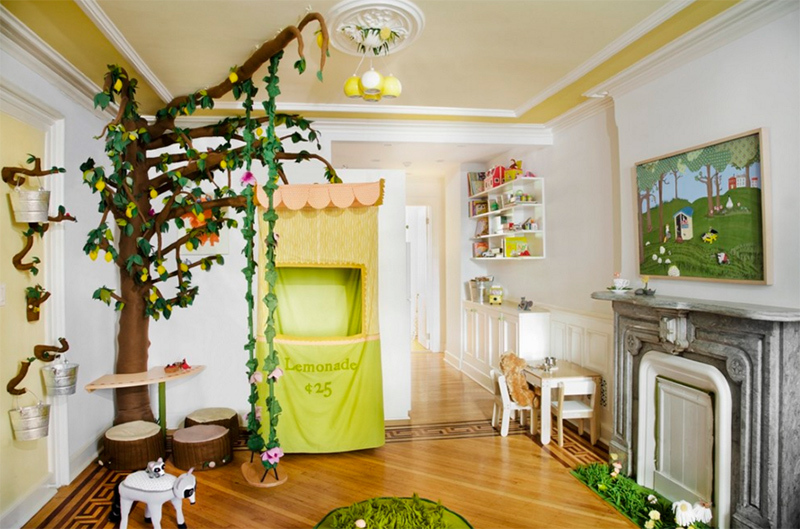 For sure, they can spend long hours in their playroom especially if it has a beautiful design. 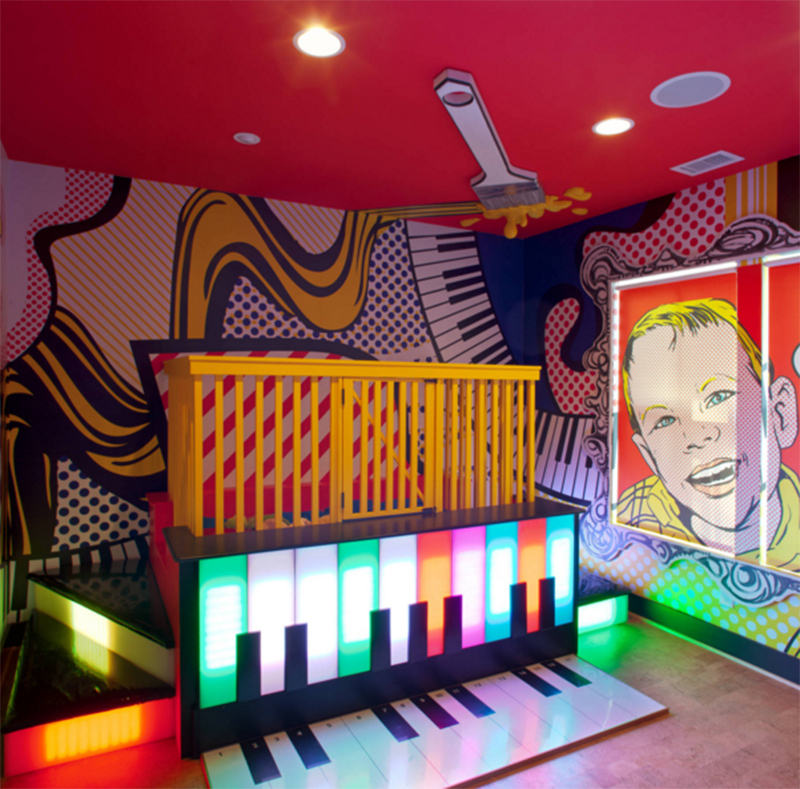 This way, the kids will not just have a good time in their own fun spaces but they can also learn a lot from it too. Remember, experience is the great teacher. So, let your kids play pretend as a teacher, carpenter, baker, doctor and others. And the best avenue for them to do that is in your own house- with or without a playroom. But of course, it would be better if they have their own playroom. 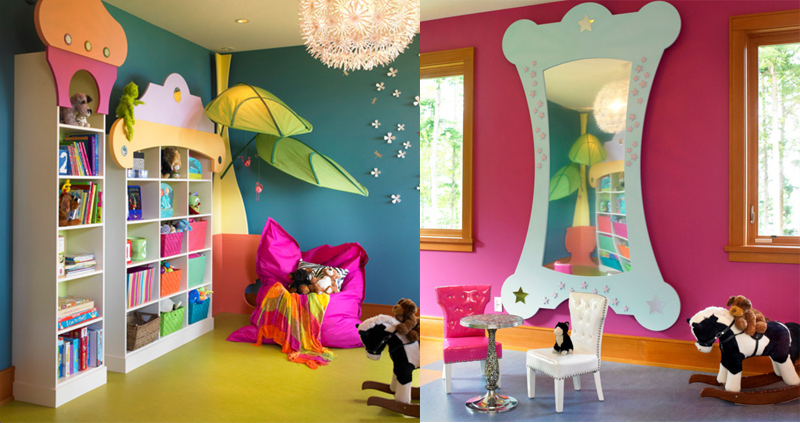 So, if you have spare area or room in the house, then turn it into a special space for your kids. There are different ideas for you to do that and you will surely be pleased to know that we have collated some extremely creative and unique playroom ideas where you can get inspiration for your kid’s playroom. 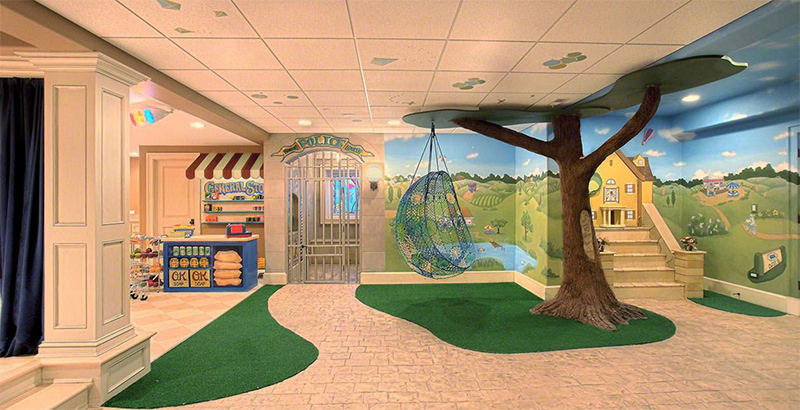 Scroll down and take a look at the playroom designs below. 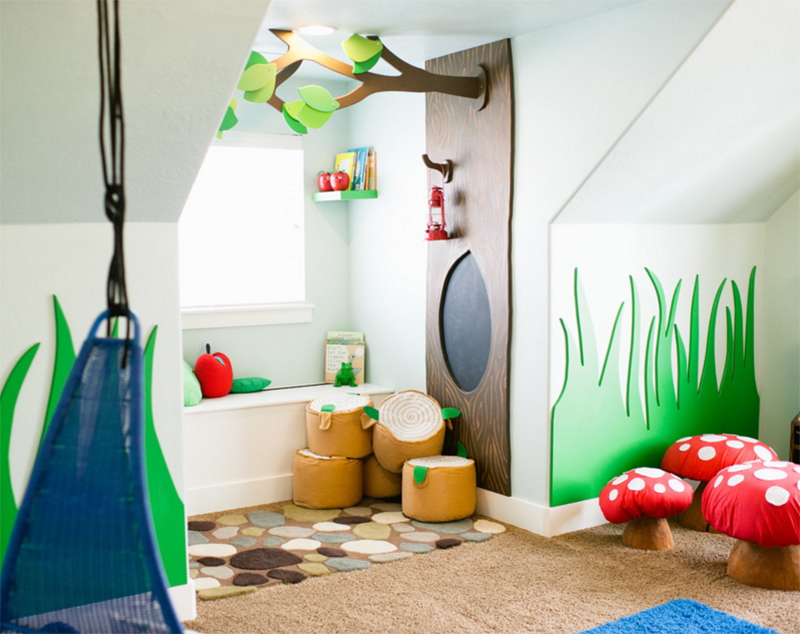 This woodland themed playroom looks really creative with mushroom stools and tree stump ottomans. The tree designs on the wall look really nice! 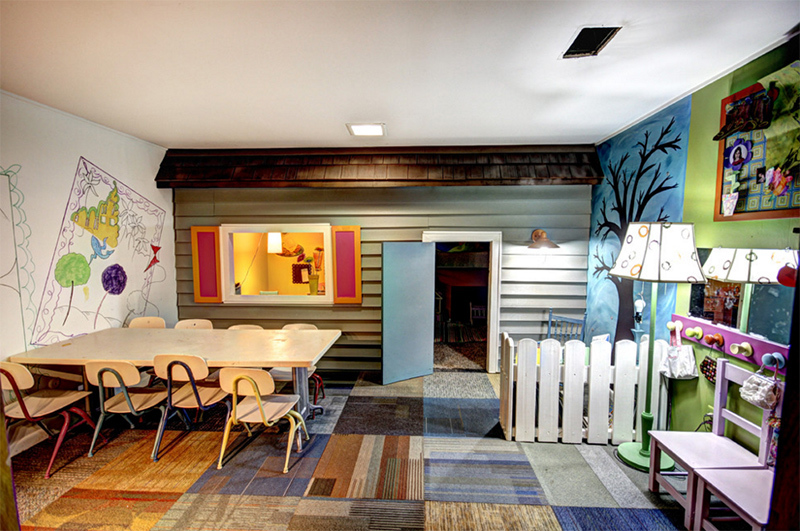 You can add a house inside your space where the kids can play and murals always work too! 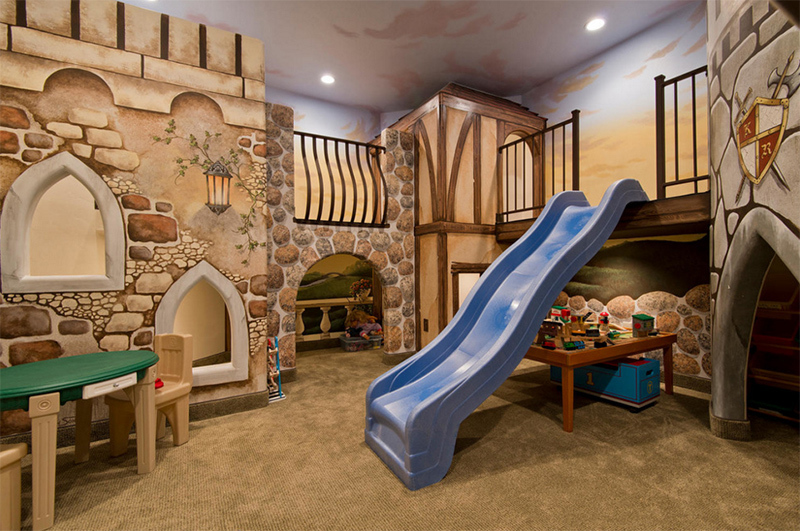 Your little princess and knights will love this classic castle themed playroom with slides and all! This is a modern playroom with lovely shapes and lines. And it is perfect for kids who are adventurous. 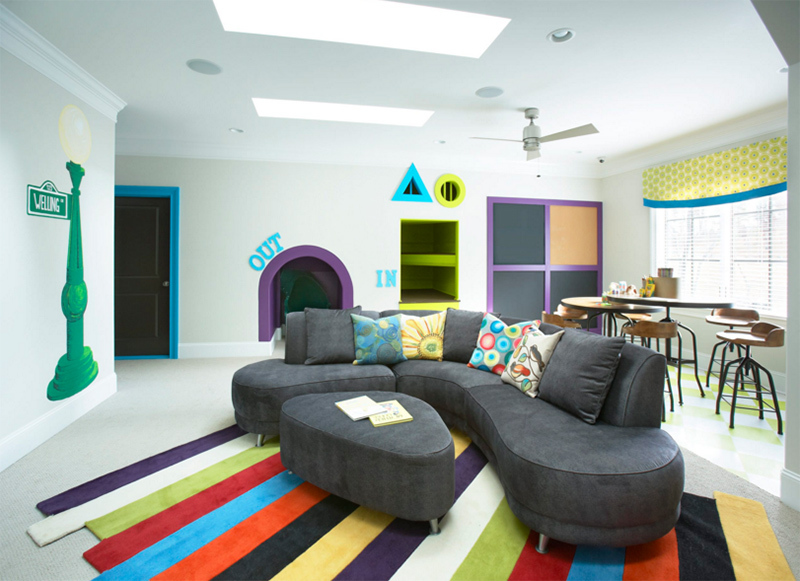 Another modern playroom with modern colors and interesting use of geometric shapes. It has a special space for using laptops and other gadgets. Create a tree in the bedroom with a hanging chair to give it a stunning and interesting design. 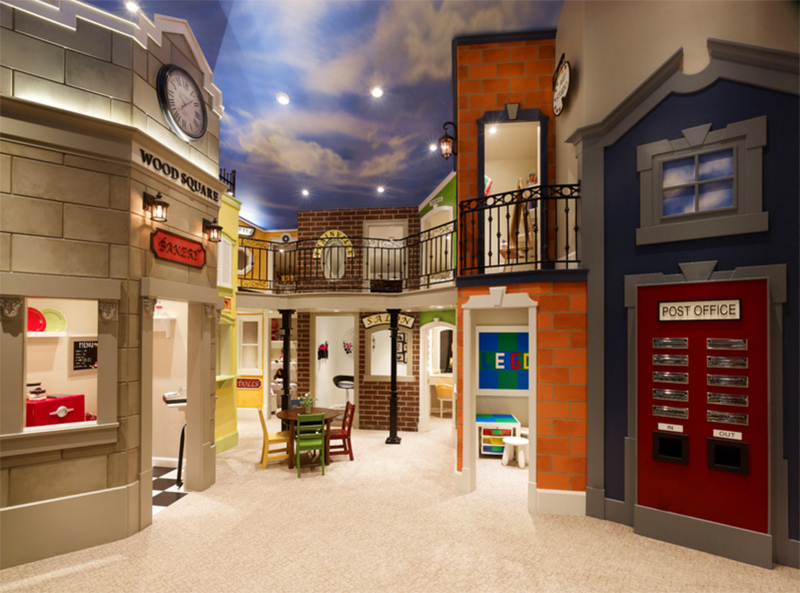 This playroom has various areas from a school to a store. This one has lovely colors in it and what makes it gorgeous are the wood work designs as well as the furniture. A woodland wonderland that is full of unexpected secret places to discover. You can see that it has an interactive tree with Velcro-able lemons which can be “picked.” There are other interesting features of the room just like that lemonade stand. 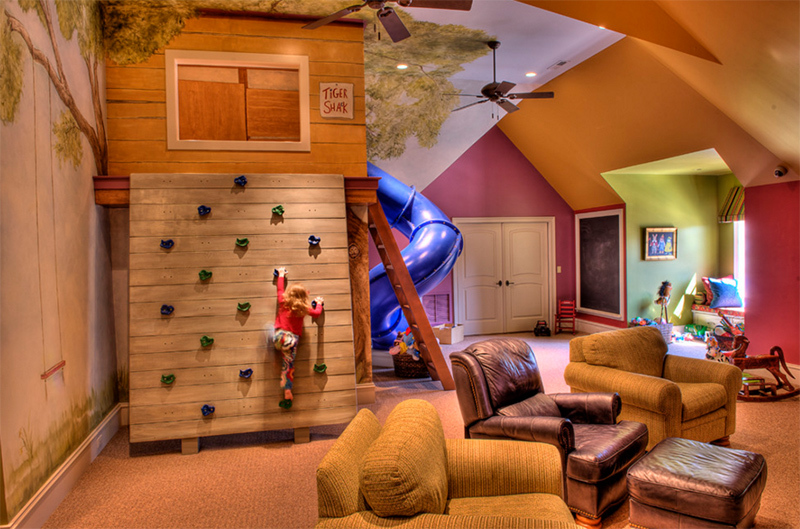 A large room for the kids that features a climbing wall, super slide, TV, chalk boards, rocking horse and others. 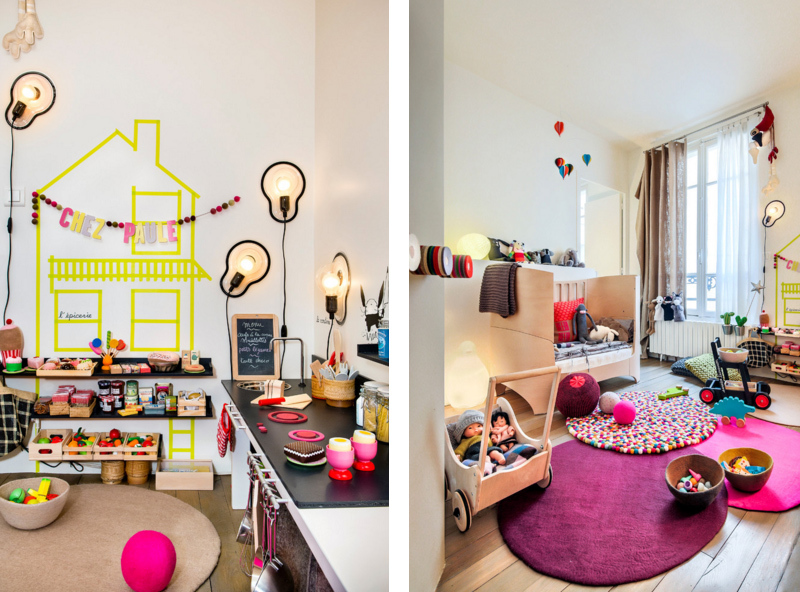 This is such a cute playroom with a modern design from its kitchen to other areas. And it is also full of colors too. Another modern space with colorful throw pillows for the tepee. 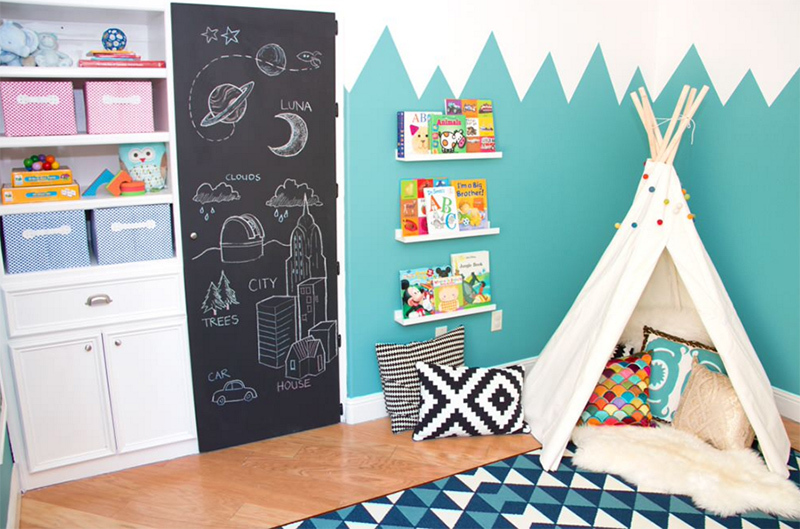 The door is painted with chalkboard paint with lovely drawings. A contemporary playroom in black and white. What I like here are the cushions that are covered in different designs, the swings, the teepee and the entire space! 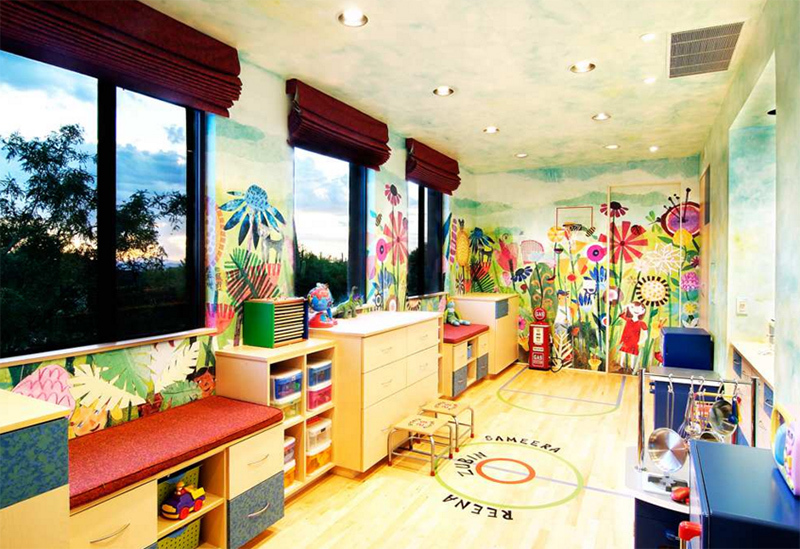 This playroom has a beautiful wall mural of flowers from the walls to the ceiling. 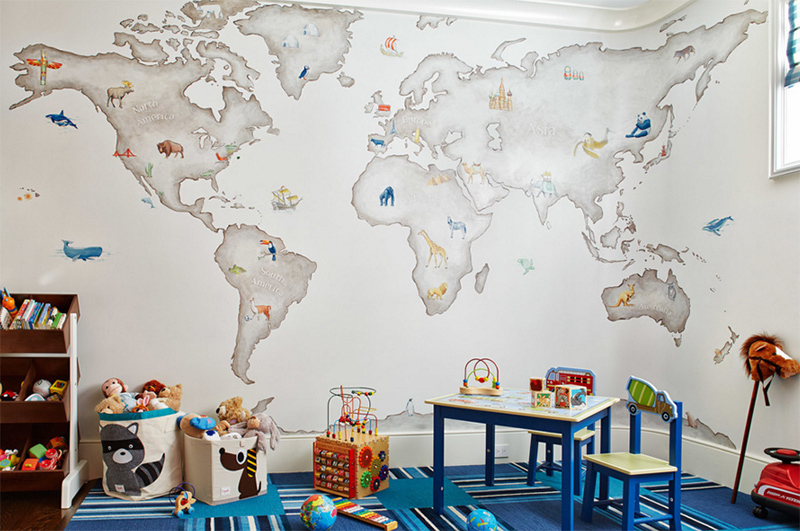 This playroom fits for a boy with a map where some interesting and informative details were added. If your kids like Mickey and his friends, then he will surely love this one. 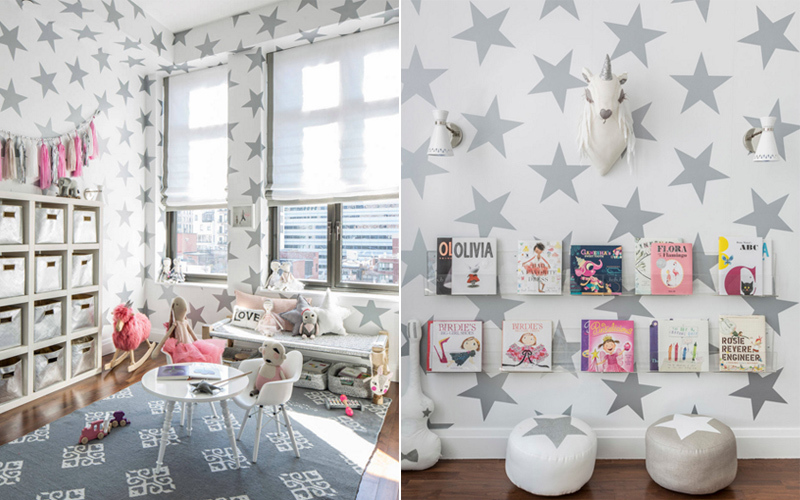 I find this playroom really cute as walls are covered with stars and even the poufs have stars on it too. A white and silver motif isn’t bad after all! The flooring of the playroom is so full of colors. You can also see colors from the chairs as well. This may appear simple but it was able to add some fun details like the shapes on the wall and a street lamp with a sign mural. A retro themed bedroom with a piano bed. The lights in it look really attractive. 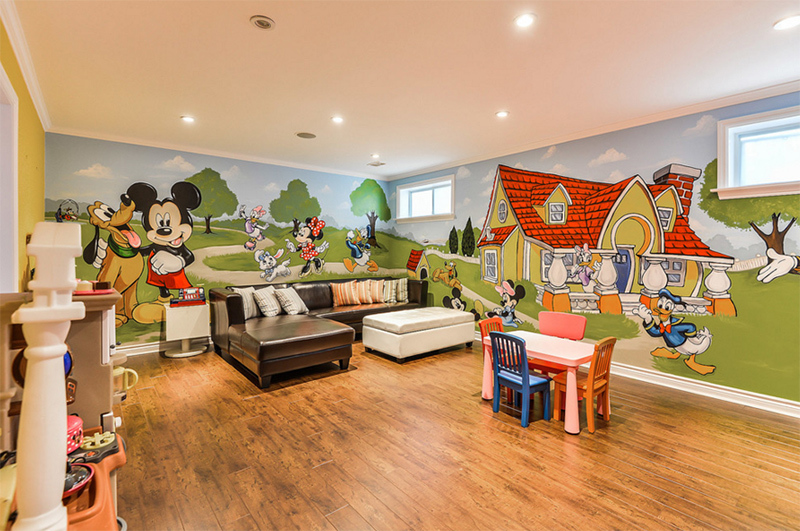 A traditional playroom which is animal themed since you can see different animals everywhere from the wall mural to the cushions. 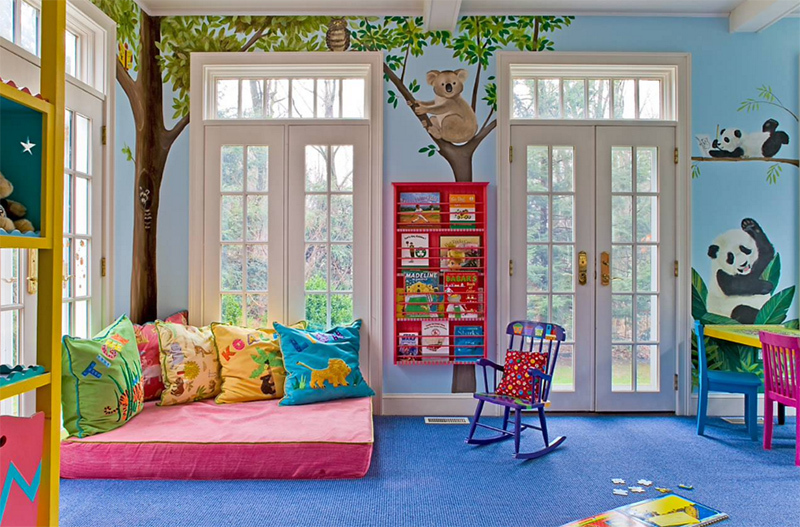 If you have a bigger budget, this would be a perfect idea for a playroom with buildings and a tall tree as a bookshelf. You can add a lot of buildings in a playroom. Apparently, you need to allocate a huge budget for it but for sure it will be worth it! 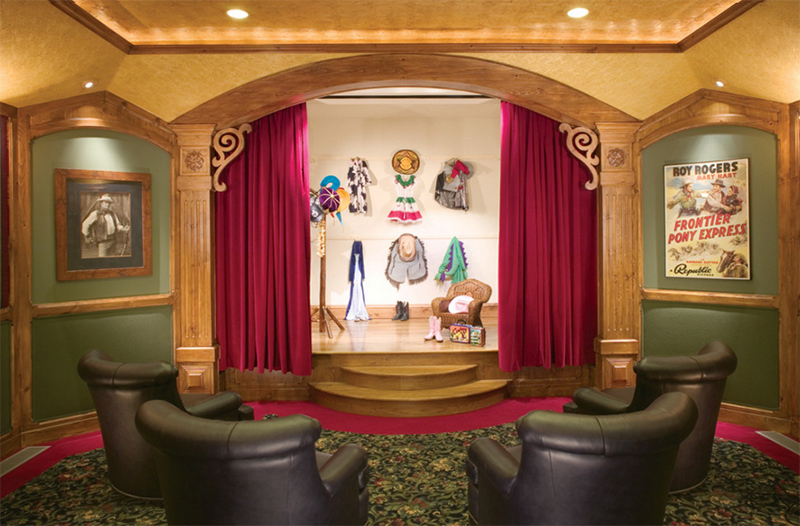 If you want your kids to develop their confidence and their theater skills, make them their own theater and add some costumes for them to use. Joy of Living Creative Interiors, Inc. 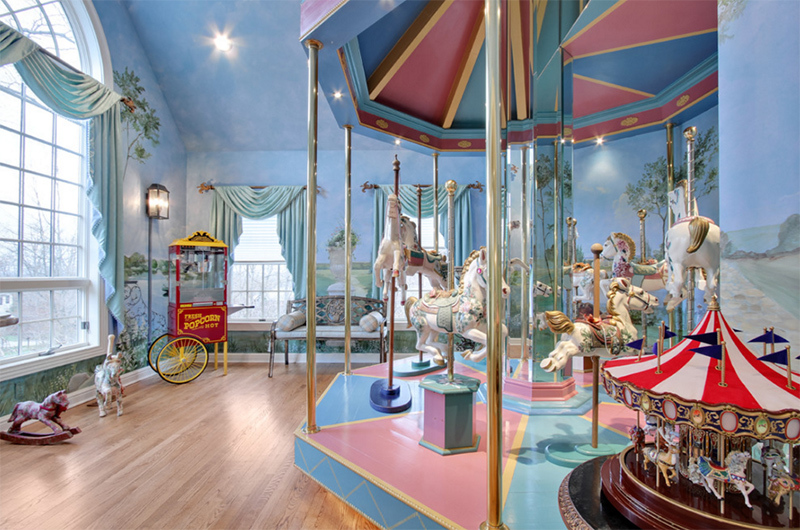 I am sure that your kids will be very very happy if they have a playroom with their own carousel! Of course it would be expensive but the smiles in your kid’s faces will be precious. 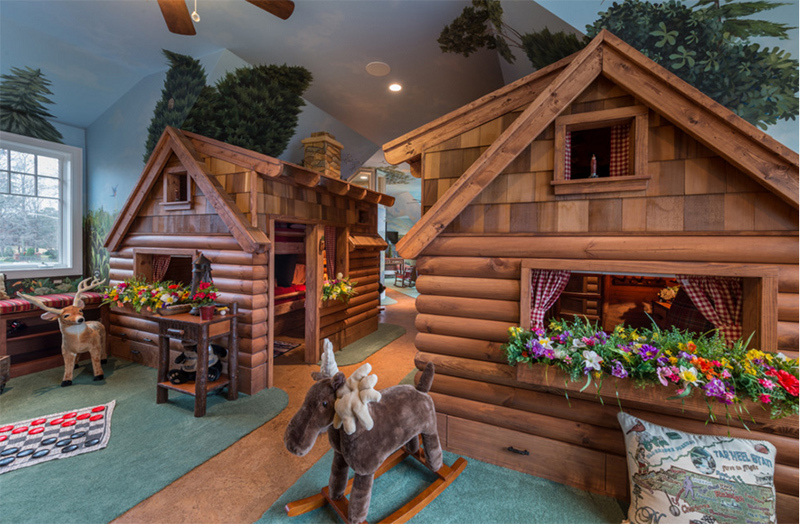 You can also add some little houses in your kid’s playroom just like this rustic themed space. 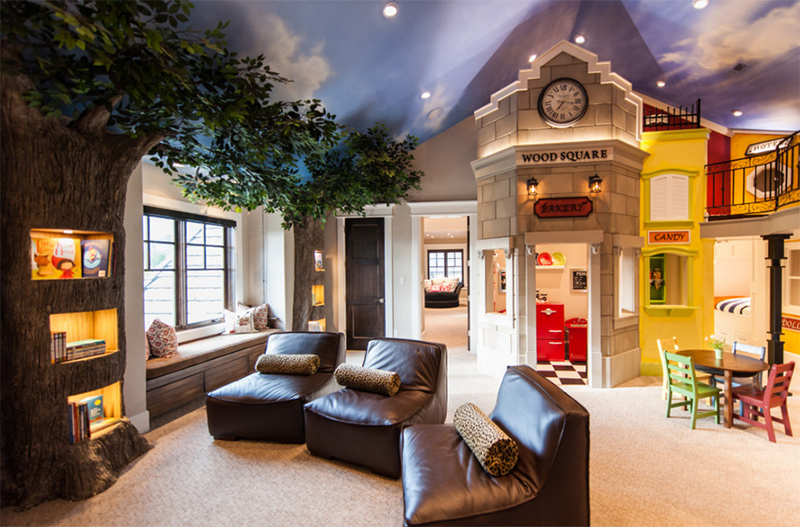 If I were still a kid, I would love to own a playroom just like the ones above. They are all beautiful and every kid will surely enjoy their creative designs. Aside from that, playrooms like this will make kids smarter since they can explore more and they can also play with different ideas in mind. I love the look of all these playroom! It even confuses me about which one would best fit my daughter. Maybe she can just choose one for herself. How about you, were you able to choose one design that your child will love?